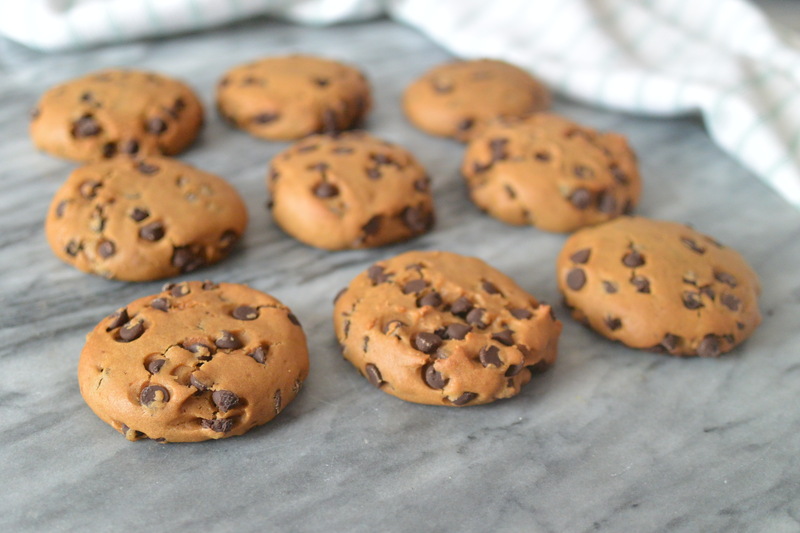 I wanted to share with you my super yummy and easy to make chocolate chip cookie recipe! This recipe was actually first made to make two giant chocolate chip cookies. My husband and I had gone out for dinner and one of the dessert options which wasn’t vegan…was a giant chocolate chip cookie with a dollop of ice cream! That had me thinking I NEED to veganize this! So last week if you follow me on instagram you would have seen in my instagram story the giant cookies! The last time I posted on my blog, I had no idea my life would change. Completely oblivious that in that same month I would find out something pretty amazing. I found out I was pregnant. Although this little intro has nothing to do with my blog post at all I wanted to let everyone know why i was not actively blogging. this was three months ago. Today I am half way through my pregnancy. YAY! I love FOOD and being pregnant I think food has become number one in my life!!! I have been eating a whole lot of certain foods I wouldn’t call it cravings because I have always loved them but I seem to be loving it whole lot more. These foods include Avocados, raspberries, peanut butter sandwiches (yes just peanut butter i don’t like jam!!) and cucumbers. I have been getting creative in the kitchen again, I found in my first trimester I was really just not willing to move all that much… I had even stopped working out!! 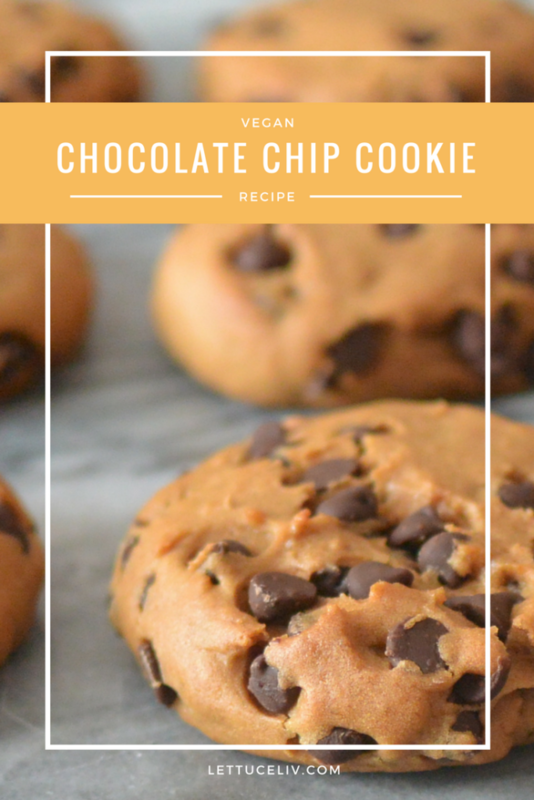 But as soon as I entered into my second trimester I bounced back into my old self and have been whipping up some fun foods one of which is this chocolate chip cookie recipe! 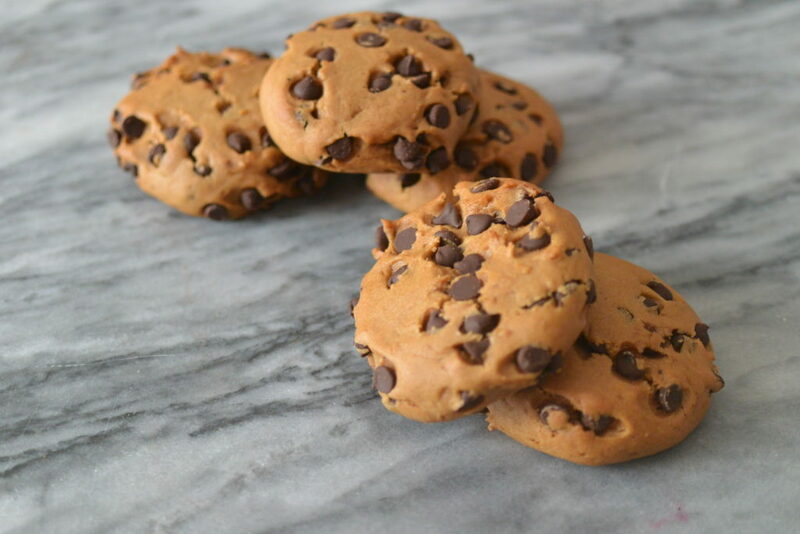 I made this chocolate chip cookie recipe with regular flour but I have made it a number of times with a 1 for 1 gluten free flour mix and its turned out tasting exactly the same! So to make this gluten free just swap out the flours! Also I find the best kind of chocolate chip cookies have ALOT of chocolate chips! I love to also chop up a dark chocolate bar and mix it into the batter to add some extra dimension to the cookies. I used coconut sugar instead of white sugar. It gives it a nice sweetness and allows you to have the brown sugar goodness a chocolate chip cookie needs. All with out the sugar crash afterwards. Coconut sugar is made from the sap of the coconut palm. It actually maintains some of it’s original nutrients It’s a much better alternative then refined white sugar. All in all this recipe makes around 24-32 cookies depending on the size you scoop out on your cookie sheet! If you like this recipe you will love my chewy peanut butter cookies too! CLICK HERE for the recipe! In a separate bowl milk dry ingredients; flour, baking soda, baking powder and salt. Combine wet and dry ingredients until well mixed. Add in the chocolate chips. Let chill for 5 minutes. Scoop out teaspoon sized balls of chocolate chip cookie dough on to a baking sheet. Press the circles flat to make perfectly round cookies. Bake for 10-12 for chewy cookies or 12-15 for crunchy cookies. I’d love for us to be friends on Instagram here’s my account CLICK HERE! And there's never enough vegan cookies in my book! Love the photos too! This looks amazing .. my daughter loves to make recipes from scratch. Im definitely going to try this one! Congratulations on the baby! Since you’re eating for two, I hope you made a double batch of these 😉 And, I agree, the best chocolate chip cookies are LOADED with chocolate chips!! Yummy!! I have been looking for a “healthy” chocolate chip cookie recipe. This is perfect Thank you!! These look absolutely delicious. I’m saving this for a fun activity and treat for a super rainy or snowy day when we can’t get outside. I love that idea! I do that too when it’s just a day to stay in bakin gis always fun! Oooh, these look so good, and I like that there are no complicated ingredients involved. Yes! That’s what I was going for! I really wanted to make things simple and easy! I’m so glad you like it! It’s great to make the dough ahead of time too and just pop them in the oven from the freezer! These looks delicious! 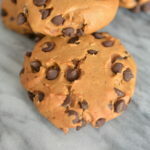 I love a good chocolate chip cookie and I love that these are vegan. Yay! Happy you found my blog/recipe!